A business organization which has a large number of employees working with it needs to take certain actions every now and then. This could be for promoting an employee, transferring him, warning him or dismissing him. Whatever the reason, this has to be done in a professional manner with the required paperwork in tow. It is for this reason that Action Forms is used. With all the essential segments in place, the user just needs to add in the details of the employee in the form. 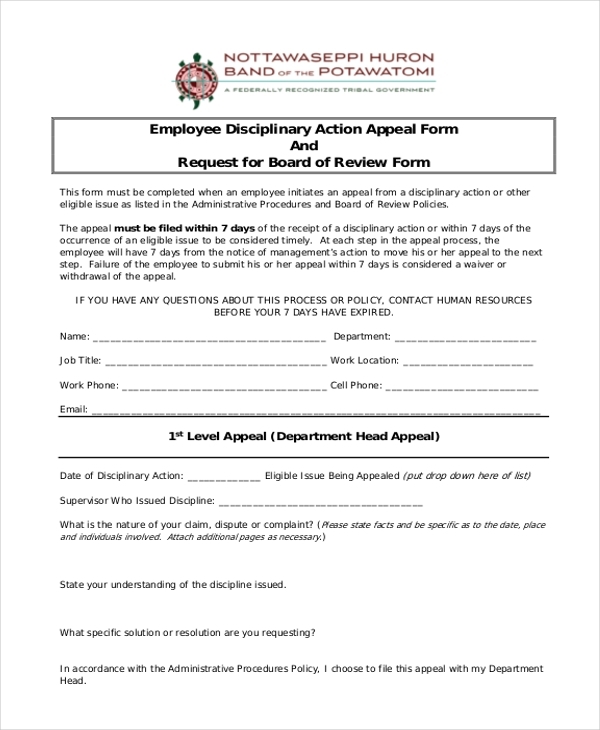 As the name indicates, this is a sample of an action form that can be used by an organization when it plans to take a disciplinary action on an employee. The form comprises of the required directions and segments. So, the user just needs to fill in the employee details in the form. You may also see Employee Action Forms. 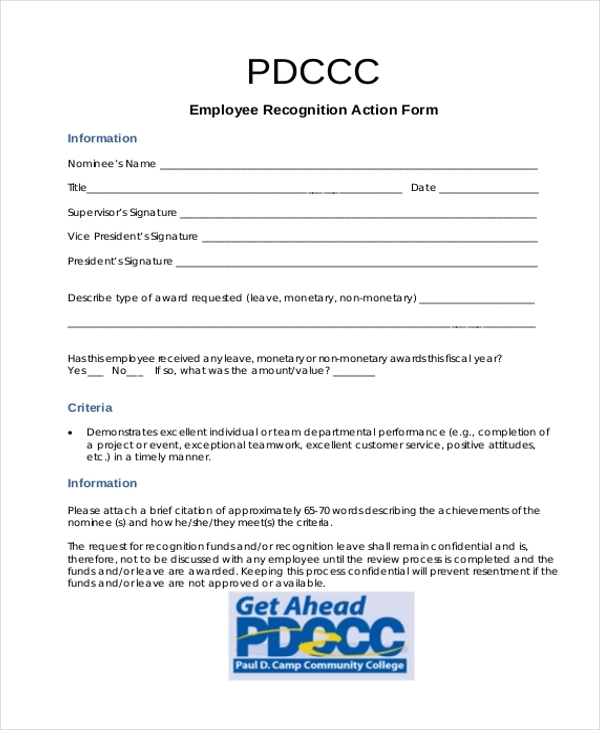 Business organizations can use this form to appreciate and honor the efforts of an employee. With a proper format in place and the essential sentences that make for the appreciation, the user only needs to add in the employee details. This action form can be used by an organization to take a disciplinary action against an employee and order a corrective step. This corrective action form comprises of the various corrective steps that can be taken which makes it easier for the user to give the directions. you can also see Affirmative Action Forms. 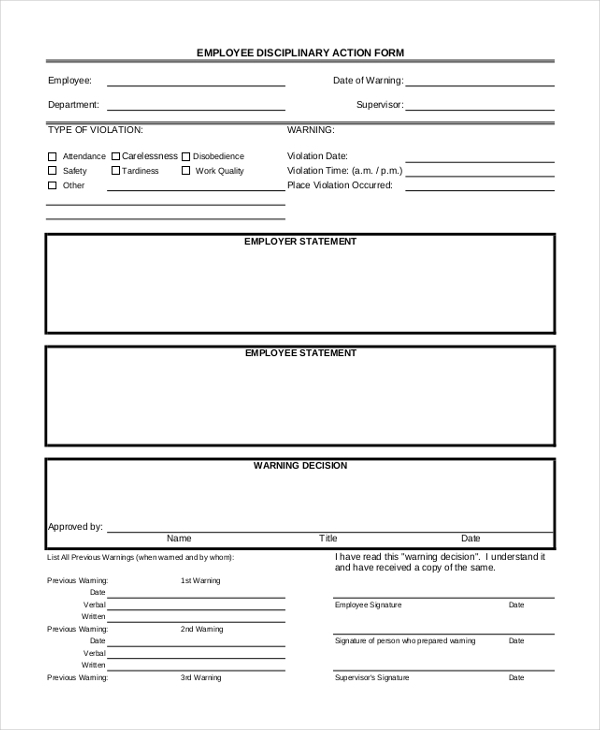 This form can be used by any organization to take an action against or in favor of an employee. The form comprises of a list of actions and the user can choose the one that is apt for the situation. He can then list the employee details in the form. Business organizations can make use of this form to allow their employees to appeal for a disciplinary action against another employee. The user is required to fill in the details of the employee in question and then add in the reasons for such an appeal. 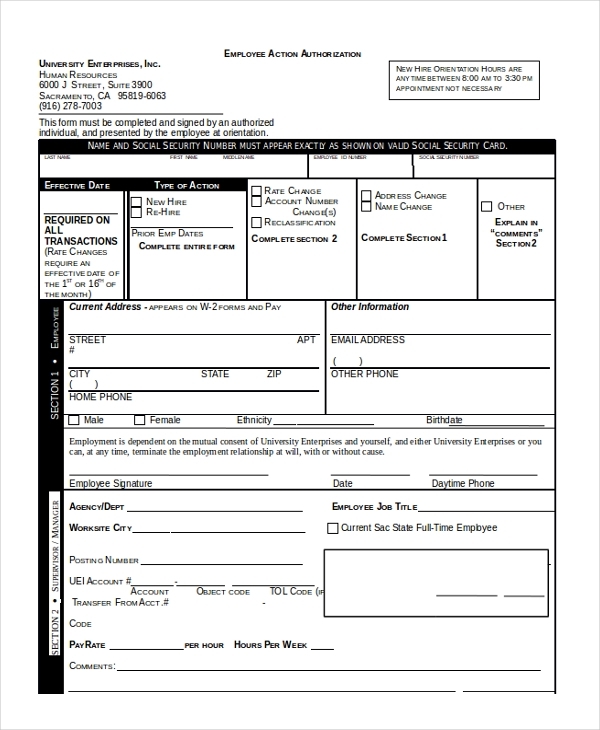 This form can be used by an organization to notify the employees of any action that has been taken. This could be hiring a new employee, transfer of an employee, promotion of an employee etc. Using this form makes it easier for the user to notify all the employees. 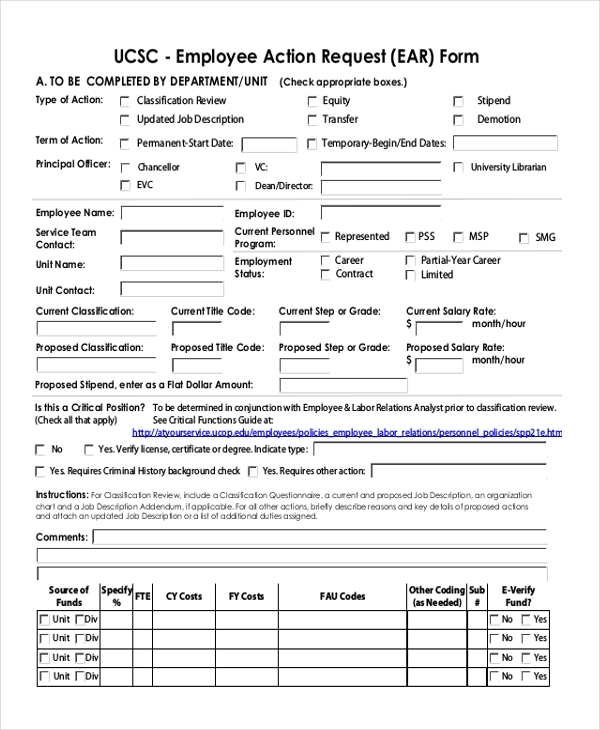 You may also see Personnel Action Forms. 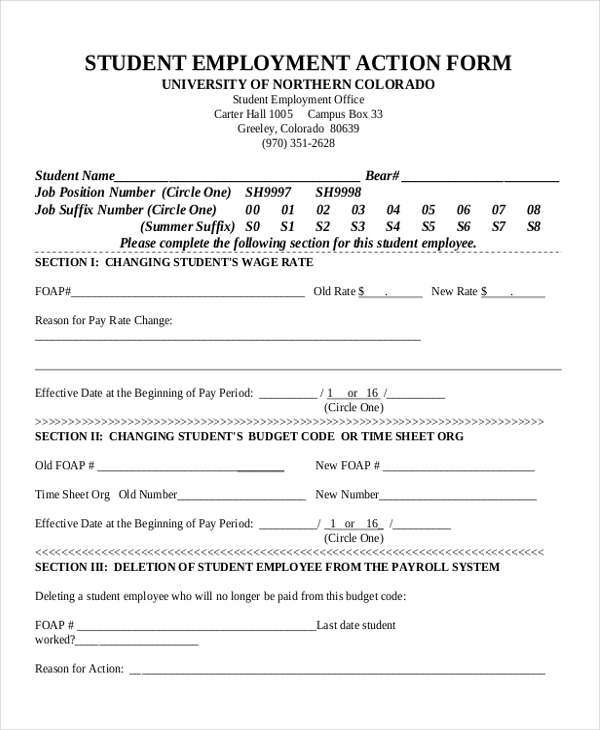 This form is used by educational institutions to take certain action against the students who may also be working part time for the institution. The form can be used to notify the person about promotion, change in wages etc. As the name indicates, this form can be used by a business organization to come up with a systematic corrective plan that can come in handy when they plan to take a disciplinary action against their employee. The form can be used to choose various actions and then make a corresponding plan. When a certain action has to be taken for an employee like a change of account details, address change etc, in such cases a proper authorization is required from the concerned authority. In such a scenario the aforesaid form can be used. You may also see Corrective Action Forms. 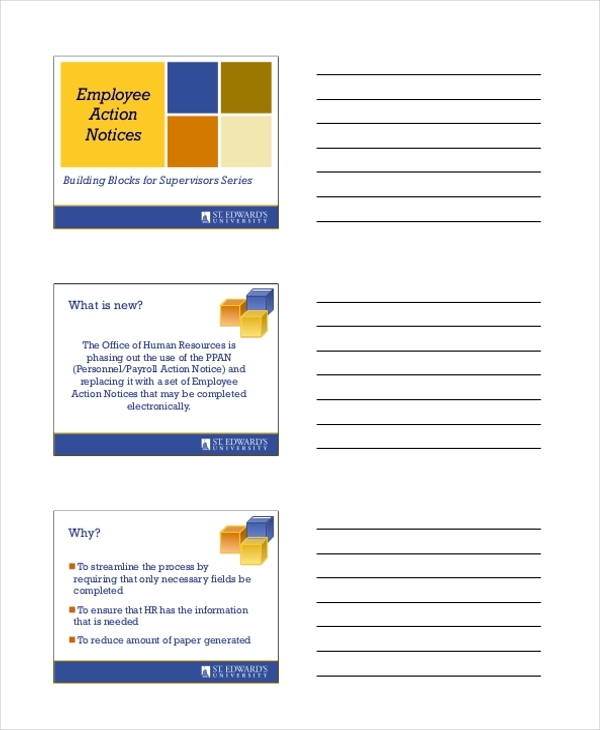 What are The Benefits of Using Employee Action Forms? Not sure how to design an employee action form? Don’t worry. We have a wide range of these forms to choose from. Browse through these and pick the one that is perfect for you. Easy to download and customize, these forms help in designing a unique document in a jiffy. You may also see Disciplinary Action Forms.